Products & Services-> Car Service Why Is It Important? Firstly, your car is a machine. When the people were making it in the factory they knew that there were certain parts of your car that wouldn't last as long as others and would need to be replaced every so often to ensure the proper functioning of your car. I think many of us take our cars for granted and don't realise how sophisticated the machine we are driving is. But also, there's loads of really very cheap parts that keep this complex machine running. Here's some. Many are specialist jobs; some aren't. Perhaps these are ones you could be doing yourself? But let's look at them first. Your car has lots of fluids - petrol, water, coolant; and gases - air, petrol/fuel mix, exhaust fumes. Each of these systems has filters in them which make sure they don't get contaminated with flies, dust, dirt etc. After a while, your filters clog up and need to be replaced. This is one of the things your mechanic should do when he is servicing your car. If you don't get the filters replaced it means your car can be sluggish and under-perform and waste fuel. Your brake pads are under a lot of friction and wear down over time. Obviously, brakes are a very important safety feature. 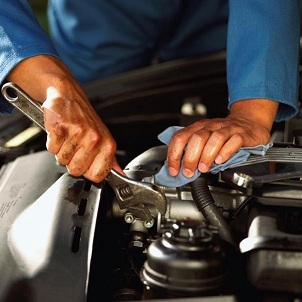 Your mechanic will check to make sure they are at a safe level. People's brake pads wear down at different rates depending on what sort of driver you are. Signs that your brake pads need to be replaced include noises coming from your brake and a drop in your brake fluid level (check your owner's manual to see where it is located under your bonnet) It is very similar to checking your coolant levels. The oil in your car is sprayed on the pistons to keep them lubricated. This then drips down from the walls of the cylinders into your sump where it is used again and again. Over time, dirt find its way in and the oil gradually just begins to lose its life. So, every so often your mechanic will have to do an oil change. Your spark plugs light the spark which allows the explosions in your engine to happen. These light about 2,000 explosions a minute which is pretty intense and after a while they begin to fail and not work as efficiently so again, your mechanic needs to replace them with new ones.